Hammond’s 75th Anniversary Album, published in 1987. The author of this scrapbook was Ms. Odette Lacroix-Lalonde. The publication of this book in digital format is courtesy of Mrs. Jocelyne Lacroix-Thivierge and Mrs. Monique Lacroix. 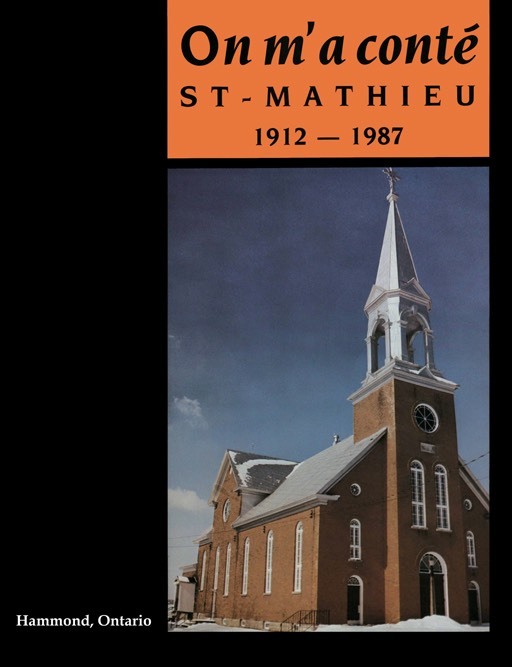 This monograph does not claim to be a rigid historical study, but rather a reminder of a series of events transmitted by the oral tradition and faithfully taken up by eyewitnesses from the beginning of St-Mathieu Parish, notably Mrs. Elsie Butler-Lacroix. Célima Diotte-Guindon, René and Ubald Gendron twins, Ovila Éthier, Délisca St-Jean-Goyer, Hervé St-Jean; documents, notes, memories, facts written and / or preserved by Anna Carriere-Gendron, Hazel Watson, John Finnamore Cooper. Facts of social, school and religious life have been recorded since the beginning of the community in the 1870s.